With horses, you can plan for everything, but what you don’t plan for will happen. I board where I board because of the extreme attention they give to the horses and the amount of care they provide. I have boarded there for years without incident, and none of the other boarders have ever had an incident. In hind sight, this situation could have been avoided, but like I just said: things happen to the best of us. I was pretty mad and upset and sad all at once, but understanding as well. I decided to share this because I’ve blogged about my journey with Cello and it wouldn’t be worth anything without honesty, and so that maybe someone could learn from it. Anyways- Cello has 15 abrasion/laceration combinations on his body from two horses with back shoes beating up on him when pastures were moved. Most of the wounds are scrapes without broken skin, but many of them do have a laceration component, and he did have straight up lacerations on his neck, hind right and hind left coronary band. His right shoulder was very inflamed on day two, and now, on day5, the swelling is down quite a bit. I was pretty devastated to go out to the pasture and find him in that condition. This summer has been amazing- there has been a snap in our relationship, in a good way. I finally feel like we bonded and ended up in a good place mutually; he perks his ears to see me, doesn’t run from haltering and is a willing partner under saddle. We had an awesome night playing with obstacles the night before, and I couldn’t wait to ride him on Thursday. So my super good mood was crushed when I saw his state. I just love him so much and he means so much to me. Cello was in a pasture with a mare and a mini horse for the last month and a half. They got along great. In the pasture shuffling the mare and mini were moved to another field, leaving Cello solo. Then, one by one, 4 geldings were moved into the pen Cello was in, from the extra-super-large pasture they had been in (together) the last 4 months at least, if not longer. Cello had been with all of these boys before, but this introduction did not go well. The person who moved the horses said they were quiet when watched at first, so they were left to their own devices. The person renting the house that overlooks the pasture said it wasn’t long and two of the biggest geldings, who have back shoes, cornered Cello and pummeled him. She’s not a horse person and didn’t know what to do, so she just watched with sadness. I showed up not too long after it all ended. Cello was by himself in the far corner, but I didn’t think anything of it at first. When a new horse is introduced to the herd, there’s always infighting to some degree and shuffling. A kick, a bite, a few or combination of each is completely normal. 15 is not. I highlighted the word introduced for a reason. Here is where I think this all went wrong. If one horse is introduced to a settled herd in that herds’ familiar space, it’s a matter of finding a place on the pecking order, which is figured out with body language. It’s how they communicate. In this case, a settled herd was moved from their familiar space to a smaller, new space. They ran as a herd to scope it out and there was one lone outsider horse in the pasture. They were excited, they were overstimulated, they were bonded (I use that loosely as herd dynamic shifts frequently.) Bottom line, they beat the crap out of the loner in the pasture. Cello had been with all these boys before for extended periods. One of them was his best buddy for two years (who stayed out of the fray with the oldest gelding.) Back then, there wasn’t so much as a mark on Cello. The difference was in how the introduction was made- before he was one new horse entering an occupied space; in this case he was the loner with 4 bonded horses claiming a new territory. If he had been introduced to them in the extra-super-large pasture where they were comfortable, the herd dynamic could have been established in a quiet and more confident way. Then it would possibly have gone smoother when they were moved as a group to a new space. The point of this is hindsight is 50-50. It’s easy to look back and say “well, this is what went wrong and how it could have been avoided.” However, the incident you don’t plan for is the one that will happen, guaranteed. The person who moved him (I’m being vague to avoid blame.. they felt bad and did everything they could to compensate… has a huge heart) didn’t think much of it as the same horses have been there for years and they had all gotten along so well in the recent past. Regardless, it happened, and I am very sad and heartbroken that my horse looks how he looks (and must be sore though he isn’t showing it.) He isn’t rideable at the moment, either, as many of the abrasions are where the saddle goes, his shoulder is swollen and I want his coronary band 100% healed before working. Immediate cleaning with very weak Betadine, which is a providone-iodine surgical scrub. Application of Finish Line to all wounds, which is nitrofurazone free. Nitrofurazone is found in many barns but can actually be caustic on wounds, so I would always recommend consulting a vet before using. One of the biggest ways to help minimize scars is to focus on cleanliness and moisturizing. Finish Line was applied the first three days as it was immediately on hand. Conservative dosage of an anti-inflammatory. This can be done twice a day but it’s only be administered once a day. From day 4 on, after the rinsing with Betadine, I allow the wounds to air out and dry naturally. Then I cut open fresh aloe leaves and apply two coatings of aloe to each wound. This is being done twice a day with help from the awesome owner of the facility. Lavender essential oil rub (all natural) on his muzzle and chest. 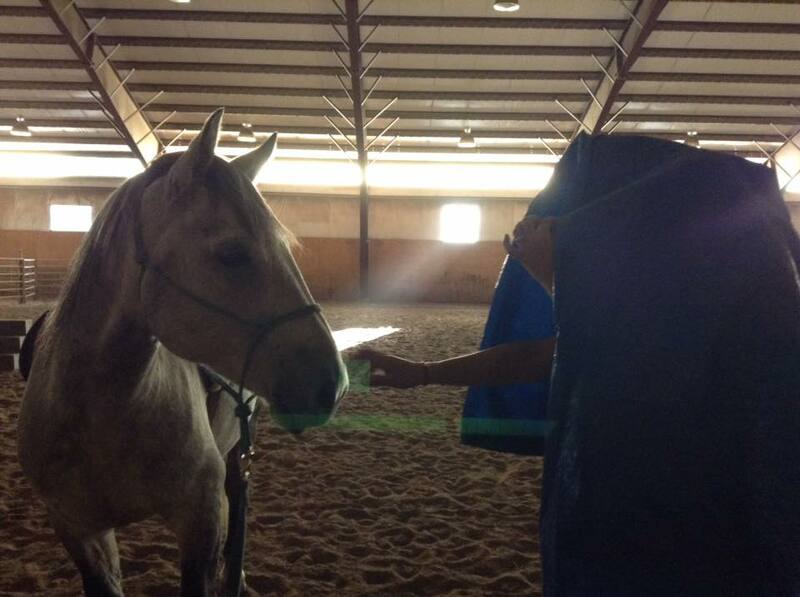 The deep sighs and the way he reaches for it is endearing- lavender is clinically proven to relax horses. I talked to my vet and consulted some other horses people and ordered Derma Gel from Amazon (we live in the mountains, stores are far away.) I also have an all-natural salve coming from my friend Sierra Hawksley, who has an online store selling herbal remedies. You might remember her from the Loveland Extreme Makeover, where she trained Yarrow. She has great before and after pics from an injury her horse suffered (it happens to the best of us) and her remedy actually has many of the same ingredients found in Derma Gel, but fresher! So I will do another post on the Derma Gel & Sierra Concotion very soon. Pictures below. The tarp photo was just an adorable moment from the night before the incident.